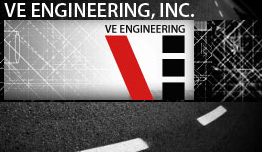 VE Engineering, Inc. | The Maryland Asphalt Association, Inc. VE ENGINEERING, INC. is a woman-owned consulting firm providing professional construction inspection services. Founded in 1983, the Company specializes in construction inspection and materials testing services to support transportation, infrastructure, public works, and commercial development projects. Our clients include state departments of transportation, county and municipal governments and private sector clients. VE has a reputation of providing responsive, flexible and quality service to meet our client’s needs. Whether the project is small or large, VE assembles a team with the technical expertise to get the job done right. Our focus is to provide innovative solutions that reduce overall project costs, which has helped us build an impressive record of delivery on time and within budget projects. VE takes great pride in the technical competence of our inspection personnel. Our staff is experienced in the various phases of construction inspection. VE understands the need for proper training and certification. Our staff is certified/ trained through the numerous organizations that set the standards for this field.